SCREEN SHOT of the vote – but as spread over two pages – unfortunately not all names of the noes are in the shot. However, those who have voted contrary to the interests of the Sydney community – the AYES – are here on display! * A LONG READ … BUT THIS IS VERY IMPORTANT! SHARE!! The legislation here may well explain Ryan Park, Shadow Treasurer’s statement on TV a few weeks back. With the number of Liberals/Nationals in the Lower House and the tight numbers in the Upper House – is it any wonder that we get such appalling Legislation and Regulations? COPIED here parts of Jodi McKay’s speech; the full speech is worth a read. The debate on this starts on page 1 of the document. Debate resumed from 10 April 2018. Administration Amendment (Sydney Metro) Bill 2018. This bill establishes the Sydney Metro Delivery Office as a standalone transport agency and statutory corporation. In reading the Minister’s second reading speech, one would be forgiven for thinking that this was all the bill did, but it does so much more than the Minister has revealed in this House, which is why Labor will oppose this bill. I listened closely to the Minister’s second reading speech but I did not hear the real reason for introducing the bill. He noted that the Sydney Metro Delivery Office has been working successfully as part of Transport for NSW since 2011. Why the need for change? There is one agenda, and one agenda only: privatisation. ”I remind the House that before there was the shady secretive Sydney Motorway Corporation, the Government established the WestConnex Delivery Authority to oversee the construction, financing and management of the motorway. The WestConnex Delivery Authority was a public subsidiary corporation within Roads and Maritime Services. Back then the Minister for Roads trumpeted how the WestConnex Delivery Authority board offers “market leading construction finance and engineering capabilities”—in the same the way that, according to the Minister for Transport and Infrastructure, Andrew Constance, the Sydney Metro will have an “expertise based board”. The WestConnex Authority board of directors reported directly to the Minister for Roads, just as the new Sydney Metro Board will report to the Minister for Transport and Infrastructure. In considering the bill, it is important to note that the WestConnex Delivery Authority did not last. It currently does not exist, and I will guarantee that the Sydney Metro will not exist. “A year after the Government established the shady and secretive Sydney Motorway Corporation to manage procurement and project delivery functions, it closed the WestConnex Delivery Authority and transferred every single one of the authority’s functions to the Sydney Motorway Corporation. Now, as I said, the Government is finalising the sale of 51 per cent of the Sydney Motorway Corporation. It is effectively privatising the Sydney Motorway Corporation and WestConnex. The Sydney Motorway Corporation is a private company. It is constituted under the Corporations Act so it is not subject to the accountability mechanisms of government, and it is not accountable to freedom of information laws. That is concerning. It means that anyone, including me, who tries to conduct a search on WestConnex under the Government Information (Public Access) Act will meet with a blank wall. This Government has created a secretive organisation that is not accountable to this Parliament. “The bill allows for the SYDNEY METRO to enter into passenger service agreements, including bus services. Why would the Sydney Metro corporation, which this bill seeks to establish, want to operate bus services? The bill states that these bus services do not have to be connected to the operations of the Sydney Metro. This deceitful and appalling inclusion in the bill effectively gives the new Sydney Metro corporation the ability to take over any and all bus services in this State. We all know what Minister Constance is about, because we have seen it with the inner west buses. The Government is seeking to set up a Sydney Metro agency to operate bus services. “Why does this Sydney Metro authority, this Sydney Metro Board, this statutory corporation need the ability to buy or lease land? It needs it because the Minister is fattening the pig for market. If you buy that land and put it within the statutory corporation—hey presto!—you have a big corporation, a big agency, that has bus services and can develop land, and it is in legislation. This means that the Government will try to push this legislation through today because it needs to start work so that, if it wins the next election, it can then sell the Sydney Metro. This new Sydney Metro agency can finance, manage and develop land for residential, retail, commercial, industrial or mixed-use development. It is just another attempt by this Government to deceive the community. Why on earth would this agency, purported to deliver Sydney Metro services, want to build high-rise development or a shopping centre? Why did the Minister not tell us that when he walked into this House to deliver his second reading speech? Now we have UrbanGrowth NSW, Landcom, the Department of Planning and Environment and the Greater Sydney Commission, all of which are about land development—and guess what? Now we will have a new authority, a new agency, that can develop land and it is called the Sydney Metro. What a deceitful thing the Minister has done in bringing this bill to this House. The Government has been incredibly quiet on its plans for development around stations. This is first time that we are finding that the Sydney Metro agency will not only operate passenger metro services but will in fact be a developer of high-rise residential buildings and retail shopping centres. It is yet another concerning and controversial aspect of this bill that the Minister chose not to disclose when he gave his second reading speech in the last sitting week. BUT he has hidden that intention and instead given a second reading speech that is full of all of his achievements and how great this infrastructure-spending and infrastructure-building Government is. What a crock that is! That means that, for the first time in a bill, an agency will be released from having to comply with the Government Information (Public Access) Act—GIPA Act—rules for corporate plans. That is just ridiculous; it is purely about hiding information. After the Desane verdict in the Supreme Court – what does this mean for their stinking legislation? Will they re-work the Legislation to try get around the Supreme Court ruling? Following on from WESTCONNEX COMPULSORY ACQUISITION debacle …. THIS IS GETTING REALLY UGLY FOLKS! The LNP have sold off our Heavy Rail Network from Chatswood to Epping to Hong Kong Consortium apartment developer MTR; extending the line out to Rouse Hill; having decreased the size of the tunnels to prevent access by double deck trains; to develop high-rise towers en route. DITTO for Sydenham to Bankstown Line. “We have seen that the plan for the Sydney to Bankstown line to be ripped up and replaced by a metro has all to do with over development and nothing to do with expanding public transport. Greens NSW will oppose the Transport Administration Amendment (Sydney Metro) Bill 2018. Greens NSW MP and Transport, Roads and Ports Spokesperson, Dr Mehreen Faruqi MLC, has raised alarm over further fragmentation of the public transport network and the broad land development powers being given to Sydney Metro Authority through this legislation. “The creation of a separate Sydney Metro Authority is a further fragmentation of our public transport network, and yet another indication of this Liberal-National Government’s intent on privatising and selling off our public transport piece by piece. “The far-reaching mandate for Sydney Metro Authority to forcibly acquire and develop land for commercial and residential uses is a cause for serious alarm. Sydney Metro Authority is set be a property developer that also runs trains. “We have seen that the plan for the Sydney to Bankstown line to be ripped up and replaced by a metro has all to do with over development and nothing to do with expanding public transport. This bill gives open slather to the Government to forcibly acquire people’s homes for property development. This is not value capture, this is highway robbery. “This bill essentially creates Sydney Metro as a competing body for Transport for NSW, undermining its specified role as a coordinator of policy and services across all modes of transport. This is another blow to any hope of integrated transport planning in our State. “The fact that Sydney Metro can completely bypass Transport for NSW and the Planning Department goes against the most elementary principles of proper and holistic planning, which should be done in engagement with all stakeholders and departments,” she concluded. * MORE TO THE POINT…. Transport Minister Andrew Constance was unapologetic about the fewer seats, emphasising that “ultimately this is the very nature of metro-style trains”. “This is what metro systems do. This is a turn up and go, high frequency service – there is a train every four minutes,” he said. DOES this sound like “policy by decree”? DOES it sound like they don’t care? -to utilise a metro train that will only seat a third of its passengers for distances far in excess of their use overseas. It all appears to tie in with The Greater Sydney Commission which has been created so developers don’t have to go through Councils. Hence the imminent overdevelopment and high density for railway corridors. The Metro will travel from Rouse Hill through the North West and comes out at Epping and across to Chatswood. This train will only seat a third of its passengers; to offset this the Government advises there will be a train every four minutes. From a reliable commentator CAAN has been advised this train is based on the model that is used elsewhere in the World however they don’t travel the distance they are expected to travel here in Sydney of 60Km or more! The alternative train to a single deck train was a French double deck train with three sets of doors and did not present the problems that we are told that are preventing the installation of more seats in these carriages. The French trains travel at the same speed; are very economical and very efficient. Despite this the French never got a look in; unfortunately the Hong Kong Consortium got the nod. The main issue here is that these trains do not provide seating; they are a short haul train, and that is why they don’t need the seating in Europe and Asia whereas here in Sydney they are going from Rouse Hill to Bankstown (70Km) or even from Rouse Hill to the city (52Km). Passengers will have to change at Chatswood. If a passenger boards a train at Rouse Hill they are expected to change trains. At the present time they will change trains at Chatswood to go to the city. The plan is that the train will travel from Rouse Hill to Epping to Chatswood ; under the Harbour through to Central and out to Bankstown a minimum distance of 70Km. Rouse Hill/Epping 24Km; Epping/Chatswood 13Km; Chatswood/Central 15Km; Central/Bankstown 18Km. What do you suppose is the reason for extending the North West Rail Link out to Bankstown? This link spells out why – an extra 36,000 new dwellings over the next 20 years as part of the State Government’s urban renewal project – that’s why! The Baird Government appears to continue to pander to the developer lobby for highrise development. What is it all about? A reflection of where they are at. Ideologically driven to accommodate their friends in wealthy places. The Greater Sydney Commission has been created so developers don’t have to go through Councils. The proposed Greater Sydney Commission Bill 2015 will give greater power to the Commission and the Minister! Once an Urban Renewal Area is approved – as with Bankstown to Sydenham landowners and developers can get land rezoned through the State Government. This proposed Bill appears to shift powers into an unaccountable body under Ministerial direction. WELCOME to the future of Sydney public transport — sleek, fast, driverless trains that can carry up to 45,000 passengers per hour in what politicians say will revolutionise travel. Minister for Transport Andrew Constance today unveiled the first glimpse of Sydney’s new metro train, with a life-size train model delivered for customer testing on Sydney Metro Northwest. The 13-tonne life-size train model has been delivered to the Showground Station site in Castle Hill and is a full-scale version of about 75 per cent of the front carriage. The life-sized model gave commuters an idea of what the trains will look like. “This is a glimpse of tomorrow’s Sydney,” Mr Constance said. “This is the game changer that’s going to revolutionise train travel across the entire network. A key part of the new train is the platform screen door technology, which keeps people and objects away from tracks and allows trains to get in and out of stations much faster. Inside, customers will be able to see from one end of the train to the other and it will have padded fabric covers on the seating — unlike many metros, which have hard plastic or stainless steel seats. The new Sydney Metro train won’t have a driver. It will be able to move 45,000 passengers per hour. There will also be space for prams, luggage and bicycles as well as wheelchair spaces and separate priority seating for those with reduced mobility. Mr Constance said it would be a metro train on par with the great cities of the world. “To give you some comparisons, the existing train network can move 24,000 passengers an hour. The new metro system can move 45,000 passengers an hour,” he said. Sydney Metro Northwest project director Rodd Staples said the life-size train model will be tested over coming weeks with a range of people including school groups, parents with prams, the less mobile as well as emergency services and engineers. Customers can have their say on internal features like seating, safety, customer information, lighting, and the grab poles, with the feedback taken on board before the new trains go into full production next year. Epping MP Damien Tudehope, Minister Andrew Constance and Castle Hill MP Ray Williams unveil the new train. “It’s all about getting the best customer outcome,” he said. Mr Staples each train will have six carriages, carrying up to 1100 people, with more than 30 per cent finding seats. The Sydney Metro Northwest will be open to customers in the first half of 2019, delivering a train every four minutes in peak times. Sydney Metro will also have an important role to play in relation to “place making” in the precincts that will be serviced by the Metro. In order to ensure transport and land use planning are truly integrated, and to enable Sydney Metro to play an effective place-making role, Sydney Metro will be empowered to assist planning and transport authorities in preparing strategic plans for the revitalisation of land in the locality of Sydney Metro. Sydney Metro will provide the catalyst for the revitalisation of vibrant and active local communities. Sydney Metro will be tasked with working across Government to lead the delivery of a world-class metro system focused on customers and great local places driving the State’s economic growth well into the future. 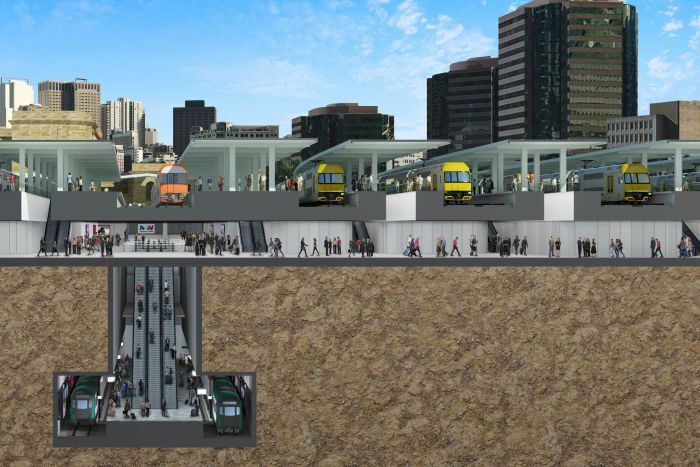 The bill further contains provisions to assist Sydney Metro with its place-making functions. Sydney Metro will be authorised to carry out, finance, manage and otherwise participate in residential, retail, commercial, industrial, mixed-use development, community, open space and recreational facilities on land in the locality of metro stations, depots and stabling yards. This will ensure the Sydney metro system is fully integrated into, and forms part of, local communities, providing maximum opportunities for people to work, rest and play close to home, in line with the three cities concept set out in the Greater Sydney Commission’s Greater Sydney Region Plan. Sydney Metro will continue to act in accordance with the new whole-of-government acquisition standards developed by the Department of Finance, Services and Innovation and the supporting guidelines and procedures developed by the Centre for Property Acquisition. Clause 38D of the bill authorises Sydney Metro to additionally acquire land by agreement with owners in the locality of a metro station, depot or stabling yard where it is needed for the purposes of carrying out, financing, managing or otherwise participating in residential, retail, commercial, industrial, mixed use development, community, public open space or recreational purposes.